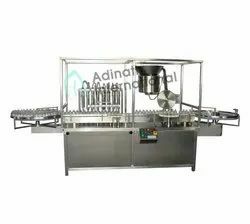 Creating a niche of Vial Liquid Filling Machine such as Automatic Vial Filling & Stoppering Machine, Two Head Vial Filling Machine, Four Head Vial Filling Machine, Eight Head Vial Filling Machine and Automatic Vial Liquid Filling Machine at its best, with utmost quality. Vial Filling Machine for 2ml, 5ml, 10ml, 20ml, 30ml, 50ml, 100ml & 250ml Vials is made in pleasing matt finished stainless steel materials. The basic unit consists of turntable, Stainless Steel Stat conveyor belt, unique eccentric pre-gassing, filling and post-gassing. Highly efficient and precision built Stainless Steel 316L Syringes, non- toxic synthetic rubber tubing and easy reach compact panel. The incoming dry vial (sterilized & siliconized) are fed through the unscrambler and suitably guided on the moving delrin slat conveyor belt at the required speed of the correct placement below filling unit. 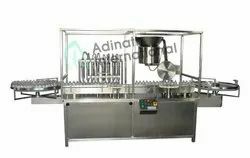 The filling unit consists of Filling Head, Syringes & Nozzles which are used for liquid filling. The syringes are made of Stainless Steel 316L construction and both, glass as well as Stainless Steel syringes can be used. A Star Wheel is provided which holds the vial during filling operation. A sensor is provided for 'No Vial-No Filling' operation. Syringes are mounted on eccentric block and driving through bottom main gear box. Volume can be either increased or decreased by increasing or decreasing stroke length of piston as per filling size. Syringes is having non return valve for sucking and delivering situation to avoid volume variation. Understanding the demands of customers as a manufacturer, supplier and exporter, we are engaged in providing Automatic Vial Liquid Filling Machine. The machines offered by us are developed under the guidance of engineers, who hold ample knowledge of this domain. Post-production, these machines are checked on various parameters by our team of quality controllers to ensure flawlessness. 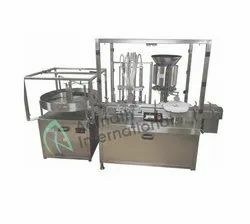 Automatic Two Head Vial Filling Machine is made in pleasing Matt finished stainless steel materials. The basic unit consists of turntable, Stainless Steel Stat conveyor belt, unique eccentric pre-gassing, filling and post-gassing. Highly efficient and precision built Stainless Steel 316L Syringes, non- toxic synthetic rubber tubing and easy reach compact panel. Power Supply 1 H.P. 1 H.P. 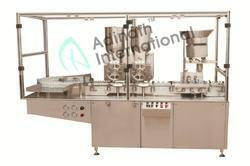 Automatic Four Head Vial Filling Machine is made in pleasing matt finished stainless steel materials. The basic unit consists of turntable, Stainless Steel Stat conveyor belt, unique eccentric pre-gassing, filling and post-gassing. Highly efficient and precision built Stainless Steel 316L Syringes, non- toxic synthetic rubber tubing and easy reach compact panel. The incoming dry vial (sterilized & siliconized) are fed through the unscrambler and suitably guided on the moving delrin slat conveyor belt at the required speed of the correct placement below filling unit. The filling unit consists of Filling Head, Syringes & Nozzles which are used for liquid filling. The syringes are made of Stainless Steel 316L construction and both, glass as well as Stainless Steel syringes can be used. A Star Wheel is provided which holds the vial during filling operation. A sensor is provided for 'No Vial-No Filling' operation. Syringes are mounted on eccentric block and driving through bottom main gear box. Volume can be either increased or decreased by increasing or decreasing stroke length of piston as per filling size. Syringes is having non return valve for sucking and delivering situation to avoid volume variation. Liquid will reach to filling nozzles through silicon transparent pipe. Nozzle will be having Up and Down movement with help of cam mechanism and it will come down when vial will be hold by starwheel for filling operation and starts filling when it starts to move up and after completion of filling operation, starwheel delivers six vials together on conveyor for rubber stoppering operation. Acknowledged in the industry as a manufacturer, supplier and exporter, we are engaged in offering Eight Head Vial Filling Machine. To manufacture these machines, we make use of optimum-grade components that are sourced from the reliable vendors of the industry. Moreover, by dispatching these machines to the clients' premises in committed time-period, we have mustered huge client-base. Catering to the demands of customers as a manufacturer, supplier and exporter, we are engaged in offering Automatic Vial Filling & Stoppering Machine. Incorporating unique eccentric pre gassing, turntable, stainless steel stat conveyor belt, filling and post-gassing, these machines are manufactured with perfection. Available in different models and specifications, these machines are offered to our customers at industry leading prices. Automatic Vial Filler for 2ml, 5ml, 10ml, 20ml, 30ml, 50ml, 100ml & 250ml Vials is made in pleasing matt finished stainless steel materials. The basic unit consists of turntable, Stainless Steel Stat conveyor belt, unique eccentric pre-gassing, filling and post-gassing. Highly efficient and precision built Stainless Steel 316L Syringes, non- toxic synthetic rubber tubing and easy reach compact panel. Vial Filler & Capper for 2ml, 5ml, 10ml, 20ml, 30ml, 50ml, 100ml & 250ml Vials is made in pleasing matt finished stainless steel materials. The basic unit consists of turntable, Stainless Steel Stat conveyor belt, unique eccentric pre-gassing, filling and post-gassing. Highly efficient and precision built Stainless Steel 316L Syringes, non- toxic synthetic rubber tubing and easy reach compact panel. 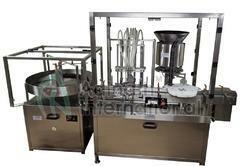 Vial Filling Machine is suitable for the liquid filling and rubber stoppering injectable vials. Machine complete in pleasing matt finished stainless steel. The basic unit consists of turntable, S.S. Stat conveyor belt, unique eccentric pre-gassing, filling and post-gassing. Highly efficient and precision built S.S. 316 Syringes, non- toxic synthetic rubber tubing and easy reach compact panel. The minimal distance between filling and stoppering units reduces the risk of contamination. The machines are designed for operation in a sterile area and for use under laminar flow protection. The un-scrambler itself has been redesigned to eliminate dead ends and difficult-to-clean spots. Note: Electrical characteristics can be adjusted as per customer’s requirements. 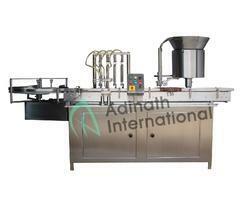 Automatic Vial Liquid Filling Machine is made in pleasing matt finished stainless steel materials. The basic unit consists of turntable, Stainless Steel Stat conveyor belt, unique eccentric pre-gassing, filling and post-gassing. Highly efficient and precision built Stainless Steel 316L Syringes, non- toxic synthetic rubber tubing and easy reach compact panel.